Elephants have significantly reduced their risk of cancer by duplicating an important gene called TP53. Cancer is a genetic disease in which cells divide uncontrollably. Some of the mutations that cause cancer are inherited, but most are the results of mistakes made when DNA is copied during cell division. By the time a person reaches adulthood, their DNA will have been copied about 30 trillion times, and each of these events could result in a cancer-causing mutation (Frank, 2010). Human cells also continue to replicate their DNA and divide throughout adult life: this is particularly true in the gut, lungs, skin and bone marrow, and again each cell division comes with the risk of cancer. Since large, long-lived organisms experience more cell divisions than small, short-lived ones, they have a greater chance of accumulating cancer-causing mutations. Indeed, models suggest that if elephants and whales had the same risk of cancer per cell division as humans they could not exist (Figure 1). Instead, they would all die of cancer at a young age (Caulin and Maley, 2011). Clearly elephants and whales do exist, and neither of them have unusually high rates of cancer. This puzzle is referred to as Peto’s Paradox (Peto et al., 1975), and it hints that large-bodied animals must have mechanisms to compensate for experiencing so many cell divisions. Recently, two groups of researchers set out to discover how elephants evolved to prevent or suppress cancer, and both arrived at a single gene – TP53. Large-bodied animals have much lower rates of cancer than models predict. Based on data on number of cell divisions and mutation rate, a model estimates that larger animals with larger colons should have a much higher risk developing colon cancer by age 70 (dashed line). This predicts a probability of less than 1% for humans, which matches reported incidence statistics in the UK (Cancer Research UK). However, although the model estimates much higher probabilities for large-bodied animals such African elephants and blue whales, cancer risk is actually much lower in elephants than in humans. Sulak et al. suggest that elephants have evolved to have this significantly reduced risk of cancer by replicating the tumor suppressor gene TP53. Whales appear to have evolved other solutions, which remain unknown. This model and figure are adapted from Caulin and Maley (2011). In humans, the TP53 gene protects against cancer, and mutations that prevent the gene from working are behind many cancers in adults (Hollstein et al., 1991). Moreover, children who inherit a mutated copy of TP53 develop a variety of childhood cancers and have a lifetime risk of cancer that is 73% in men and nearly 100% in women (McBride et al., 2014). Last year, Joshua Schiffman, Lisa Abegglen (both from the University of Utah School of Medicine) and colleagues reported a number of interesting results on TP53 genes in elephants (Abegglen et al., 2015). First they confirmed that an elephant’s cancer risk is about 2–5 times lower than a human’s; they then went on to show that elephants actually have 20 copies of TP53. Abegglen et al. also noted that while one of the elephant’s TP53 genes was comparable to those in other mammals, the other 19 were slightly different. Most genes contain a mix of protein coding sections (which are called exons) and non-coding sections (called introns). Typically, introns are removed after a gene has been transcribed into messenger RNA but before it is translated into a protein. However, all but one of the TP53 genes in elephants lacked true introns. This indicates that the 19 extra TP53 genes likely originated when an edited RNA molecule, which had had its introns removed, was converted back to DNA. Genes with this kind of history are known as “retrogenes”. Still, Abegglen et al. did not establish when these extra copies of TP53 first evolved. One way that the TP53 gene protects against cancer is by causing cells with damaged DNA (which is likely to contain cancer-causing mutations) to commit suicide, via a process known as apoptosis. Abegglen et al. exposed elephant cells to ionizing radiation (which causes DNA damage) and found that they were twice as likely to undergo apoptosis as cells from healthy humans. However, based on this pair-wise comparison, it was not clear whether the elephant cells are more prone to apoptosis, or if human cells are relatively insensitive to DNA damage. Abegglen et al. also did not establish how and to what extent the TP53 retrogenes were transcribed in elephant cells. Now, in eLife, Vincent Lynch and colleagues – including Michael Sulak as first author – report answers to many of the remaining open questions about TP53 in elephants (Sulak et al., 2016). First, Sulak et al. searched 61 genomes of animals ranging from aardvarks to whales for TP53 genes and retrogenes. Some of these animals – such as manatees and the rock hyrax – had only a few TP53 retrogenes, whereas others had multiple copies of TP53 retrogenes. By mapping the data onto a phylogenetic tree, Sulak et al. showed that the number of TP53 genes had increased as body size increased in the lineage that led to elephants. Sulak et al. – who are based at the University of Chicago, the University of Nottingham and Weill Cornell Medical College – then experimentally established several key points. They confirmed that some of the TP53 retrogenes are transcribed and translated in elephant tissue, and that these transcripts give rise to multiple forms of the proteins. Also, elephant cells up-regulated TP53 signaling and induced apoptosis in response to lower levels of DNA damage (from drugs and radiation) than cells from other mammals. This indicates that elephant cells are especially sensitive to DNA damage and more prone to apoptosis. Next, Sulak et al. showed that elephant cells need the retrogenes for their enhanced apoptosis response. Finally, adding the same retrogenes to mouse cells made these cells more sensitive to DNA damage too. Cell division despite DNA damage is a hallmark of cancer, and so Sulak et al. concluded that elephants had likely solved Peto’s Paradox (at least in part) by enhancing TP53 signaling, a feat that they achieved by duplicating the TP53 gene. The findings of Sulak et al. – which were first reported in a preprint on bioRxiv – answer many of the questions posed following the work of Abegglen et al. However, they also leave several issues unresolved. First, it is not clear if the retrogenes themselves lead to the increased apoptosis response, or whether other actors are in play. Second, does having multiple copies of TP53 impose costs and, if so, to what extent can elephants avoid them? Moreover, Sulak et al. did not find multiple copies of TP53 in whales; what other mechanisms suppress or prevent cancer in these creatures? Finally, can such insights be translated into cancer treatments in the clinic? Results like these showcase how evolutionary thinking can illuminate medical problems, especially when combined with experiments that check assumptions and establish causation. Comparative evolutionary biology suggested the paradox; phylogenetic methods revealed that gene copy number and body size increased together; and genetic experiments confirmed that the key causal links exist. Such combinations of evolutionary questions and molecular methods should rapidly advance cancer research, and may one day tell us how to prevent cancers if possible and treat them if necessary. Trends in Ecology & Evolution 26:175–182. Nature Reviews Clinical Oncology 11:260–271. British Journal of Cancer 32:411–426. © 2016, Gaughran et al. A major constraint on the evolution of large body sizes in animals is an increased risk of developing cancer. There is no correlation, however, between body size and cancer risk. This lack of correlation is often referred to as 'Peto's Paradox'. Here, we show that the elephant genome encodes 20 copies of the tumor suppressor gene TP53 and that the increase in TP53 copy number occurred coincident with the evolution of large body sizes, the evolution of extreme sensitivity to genotoxic stress, and a hyperactive TP53 signaling pathway in the elephant (Proboscidean) lineage. Furthermore, we show that several of the TP53 retrogenes (TP53RTGs) are transcribed and likely translated. While TP53RTGs do not appear to directly function as transcription factors, they do contribute to the enhanced sensitivity of elephant cells to DNA damage and the induction of apoptosis by regulating activity of the TP53 signaling pathway. 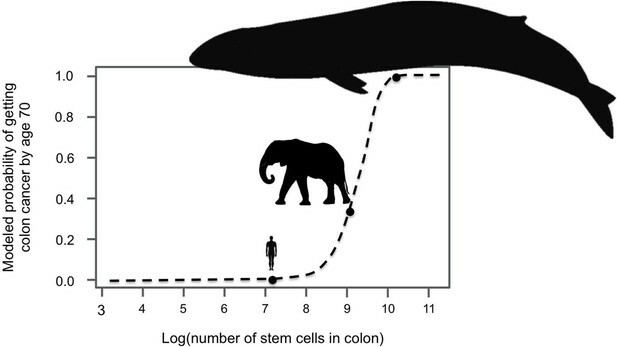 These results suggest that an increase in the copy number of TP53 may have played a direct role in the evolution of very large body sizes and the resolution of Peto's paradox in Proboscideans. Elephants have extra copies of a gene that protects against cancer.